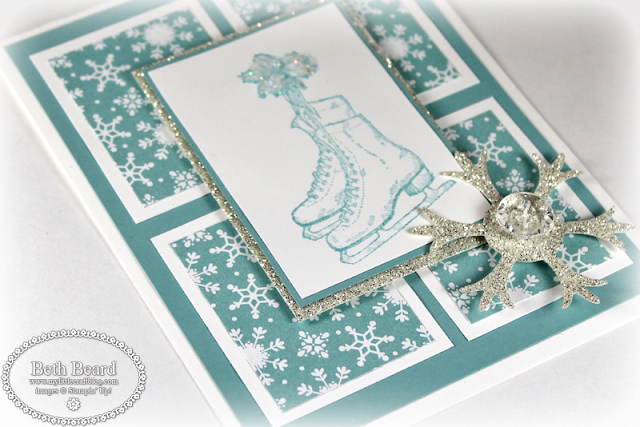 I purchased this stamp set especially for the ice skates. I always wanted to learn how to skate and envied those who knew how. I roller skated as a child and thought it must be similar...how hard can it be? A couple years ago, I purchased a pair of lovely white skates and headed for the rink for the first time. Before I stepped onto the ice, I stood there watching these young girls in the center of the rink twirling, skating backwards and doing jumps so gracefully. I thought to myself this is going to be easier than I thought. Beth, as usual, your card just takes my breath away! I'll never ice skate either....but i can surely enjoy this card!